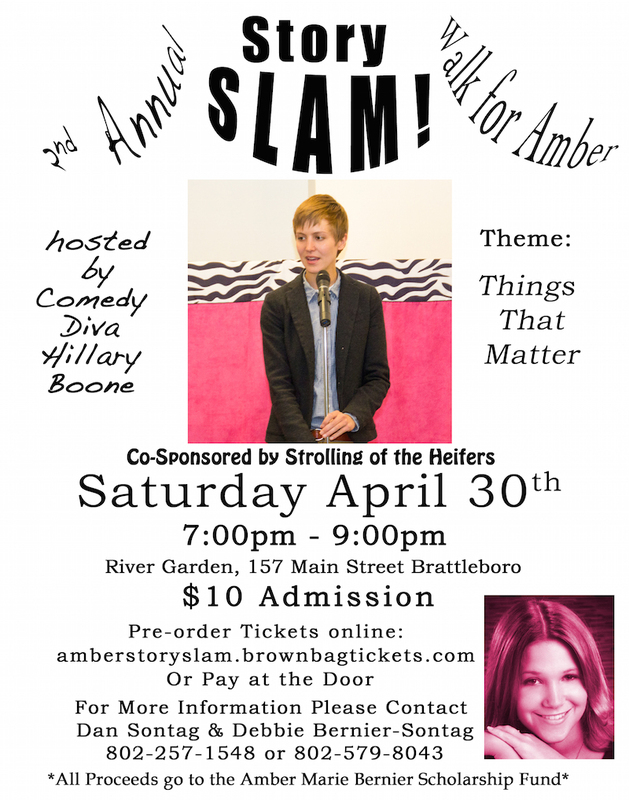 We are excited to invite the community to an evening of memorable, heartfelt, personal, funny and entertaining stories at the Robert H. Gibson River Garden on Saturday, April 30th at 7 p.m.: the “Walk for Amber StorySlam” hosted by Hillary Boone of the Vermont Comedy Divas. A StorySlam is a competitive storytelling “open mic” in which contestants are selected from volunteers from the audience to tell a 5-minute, true story related to the theme for the evening. The format comes from the tradition of the Poetry Slam and has been popularized by the NPR show The Moth as well as MassMouth and other amateur storytelling events. This year’s Walk for Amber StorySlam theme is “Things That Matter.” Related to the theme this year, contestants will have the option of using one prop or “thing” to help illustrate their story. A panel of six judges will judge the stories. 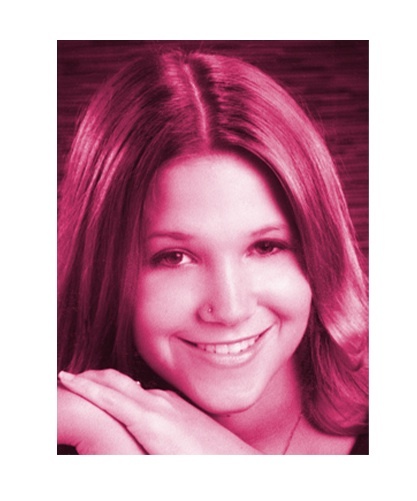 Amber Marie Bernier was a 17-year-old Brattleboro Union High School senior who died just prior to her graduation on March 3, 2004. She was a beloved student, remembered for her kindness, grace, beauty and style. The Walk for Amber is an annual series of fundraising events in support of the Amber Bernier Scholarship Fund, which is distributed yearly to qualifying students graduating BUHS. The fundraisers include the Walk for Amber Walkathon, a raffle and a dinner, all of which will be held this year on June 5, 2016. This is the eleventh Walk for Amber fundraiser. All proceeds from these events go into the scholarship fund. Hillary Boone is a Vermont comedian and storyteller who has appeared on the Moth storySLAM, and performed stand-up comedy across Vermont and New England. Hillary’s style has been described as quirky, likable, smart, and “simply delightful.” She is a member of the Vermont Comedy Divas and Divas Do Good, the country’s only all female touring stand up comedy troupe. Stories must be original and preferably based on one’s own experience. Notes and props are not allowed. Five minute time limit with a 1 minute grace period but points will be lost if the story significantly exceeds 5 minutes. Judges selected prior to the event will rate each story on a 1 to 10 scale based on the content, presentation and whether or not the story is reflective of the theme. Winner(s) will receive a prize to be determined. The Walk for Amber is an annual series of fundraising events including the Walk for Amber walkathon, raffle and dinner in support of the Amber Bernier Scholarship. This is the tenth anniversary of the Walk for Amber fundraiser. All proceeds from these events go into a scholarship fund. Annually the scholarship committee reviews applications and Amber’s parents personally interview all applicants who are generally but not exclusively BUHS graduating students. Scholarships have been given to graduates of Leland and Gray, Austine School and Hinsdale High School. To date, 25 scholarship recipients have been awarded over $16,000 to pursue post-secondary educational and training opportunities. The first Amber awards went to students following the same path as Amber was on, fashion design and cosmetology. Over the years, based on Amber’s interest in the underserved and less recognized vocations, the scholarship committee has selected recipients entering the fields of early childhood education and human services. Students who have overcome adversity appeal to the committee who strive to honor Amber’s memory.